OAK GROVE, Ky. (WDRB) -- Churchill Downs Inc. and Keeneland are teaming up to build a new racing facility in southern Kentucky. A groundbreaking ceremony was held Tuesday for Oak Grove Racing and Gaming. The $150 million state-of-the-art live and historical racing venue in is in Oak Grove, Kentucky, which is just outside the Fort Campbell U.S. Army post. The new track will be built in two phases. The first will feature a harness race course, an overnight stable facility and a race-day paddock stable which will be open for its first live race meet in October 2019. The second phase of the facility will add 1,500 historical horse racing machines, which resemble video gambling machines and offer bets on past horse races, keeping the names of horses and the race secret. A 128-room hotel, a 1,200 seat grandstand, 3,000 seat amphitheater and equestrian center will also be operational by 2020. 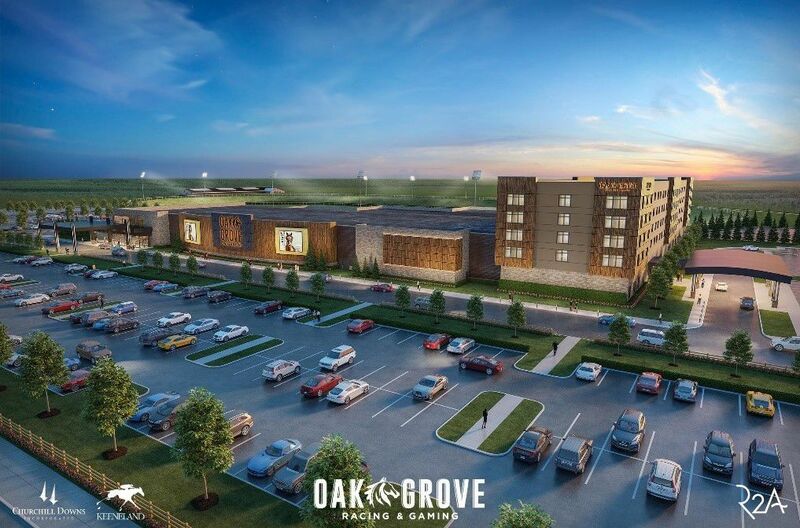 Oak Grove Racing & Gaming is expected to create nearly 400 direct full and part-time jobs in Christian County. Information on job fairs and hiring will be released in coming months. The Kentucky Horse Racing Commission awarded a license to Churchill and Keeneland for 12 live Standardbred racing dates beginning in October.